We often write about mod jobs which are mostly based on a Royal Enfield. It probably is the simplicity in the engineering or maybe just the want to make a popular product unique that makes people tinker with it. So when the bike maker invited us to sample their new Bullet Trials, our first impression, like many others, was, “A factory custom Classic huh!” But with those red and green highlights and a skyward pointing exhaust pipe, is the new Bullet Trials more than just a Classic when you’re in the saddle? We rode it through some specially carved Trials sections and trails to figure out. And before you point out, in the world of motorcycles, ‘Trials’ and ‘Trails’ are two different words. There’s no running away from the fact that the Bullet Trials is essentially a Classic. Royal Enfield isn’t shy about that fact either. But there’s history and some legacy behind the Silver paint and those red and green highlights. 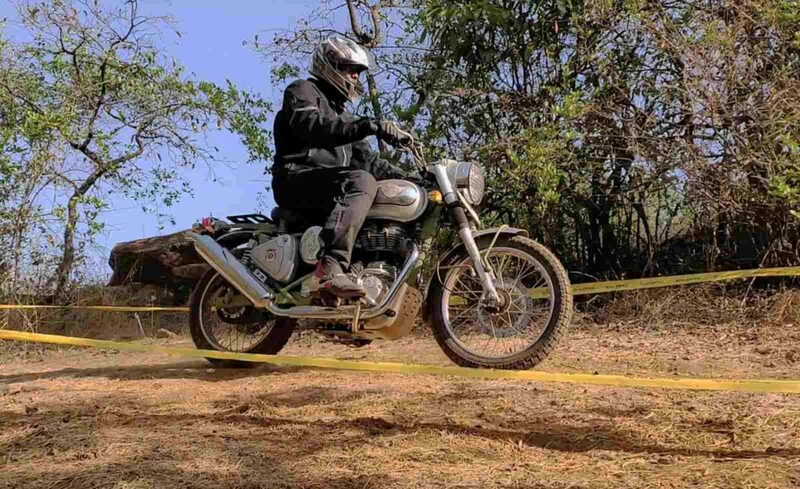 The number 48 and the Green and Silver paint job is a tribute to the legendary Royal Enfield factory riders’ team and to Trials Wizard – Johnny Brittain. With him in the saddle, RE won more than 50 championships between 1948 – 1965. Fun fact: Changing the course of motorcycle design forever, the 350cc Bullet designed by Ted Pardoe and Tony Wilson Jones incorporated the swinging arm suspension with oil-damped shock absorbers for the first time on any production motorcycle. Fast forward to 2019, the Bullet Trials doesn’t break any new ground but tries to take you back in history with simple solutions like 19″ and 18″ block-pattern tyres at the front and back, spoked wheels, the skyward pointing tailpipe and the spring supported single saddle. It also gets solid chrome protection around the engine, fork gaiters, a bash plate and a plastic guard for the headlight. We’re sure you must’ve noticed the indicators and the rear tail light is borrowed from the 650 twins. What’s it like in the saddle? For the very first time, once you’ve swung a leg over and try to get the motorcycle off its side stand, the 192 kg kerb weight is there to be felt. And if you’re a modern man who knows about motorcycle makers like GasGas, you’d start asking questions about the ‘Trials’ suffix. But once you dial your thought process back to the simpler days, the Bullet Trials does take you back in time to simpler times, fighter pilot goggles and a mud-splattered half face helmet and clothing. 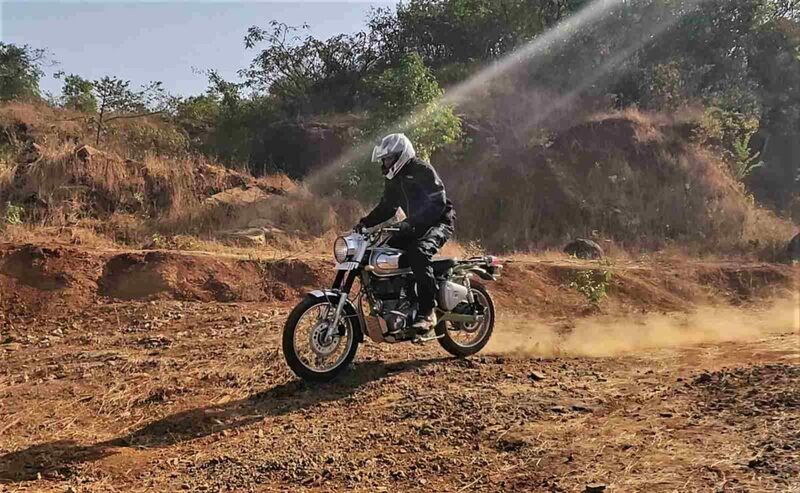 Powered by the same engine which thumps under the Classic range, we spent time with the 500cc variant which inks 27.2 Bhp @ 5,750 rpm and 41.3 Nm @ 4,000 rpm on the specifications sheet. There’s 135 mm of clearance available and the 35 mm front forks can travel for 130 mm before bottoming out. Seat height is 800 mm and braking is via a 280 mm front and a 240 mm rear disc, both governed by a dual-channel ABS system. With those figures out of the way, let’s get back to tell you how we got to the, “It’s fun. This thing” part. Out and about, there’s a healthy dose of torque pushed out towards the rear wheel from the word ‘Go’, allowing those knobs on the rear tyre to dig the ground before it can start clawing forwards. The mid-range too, is juicy, ensuring there’s a generous dose of shove available in the lower gears. 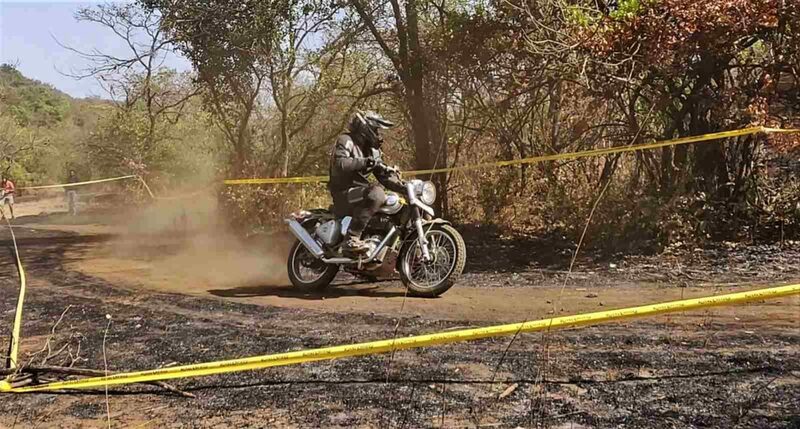 Since our riding was restricted to a special off-road course, telling you how this RE behaves on the road is for another day. 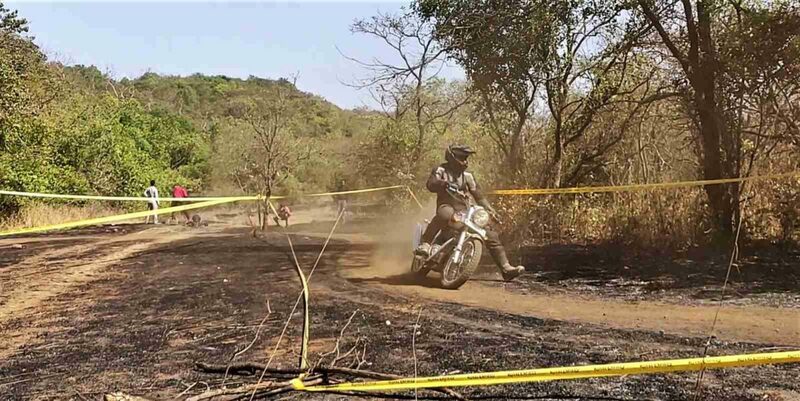 Back to the course, we first wound our heads around the ‘Trials’ genre of moto sport, by riding through three special sections. Each requiring us to ride through loose surfaces, changing elevations, and sharp turns, without putting our feet down through a marked pathway. Every time the foot went down, you scored a point. To become a Hero, one had to score a Zero. Simple, you might think. But it wasn’t. But the course allowed us to get accustomed to the Bullet Trials’ dynamics. Visual appearance and the spec sheet tells you that the bike must be pretty handful to ride when the going gets rough. 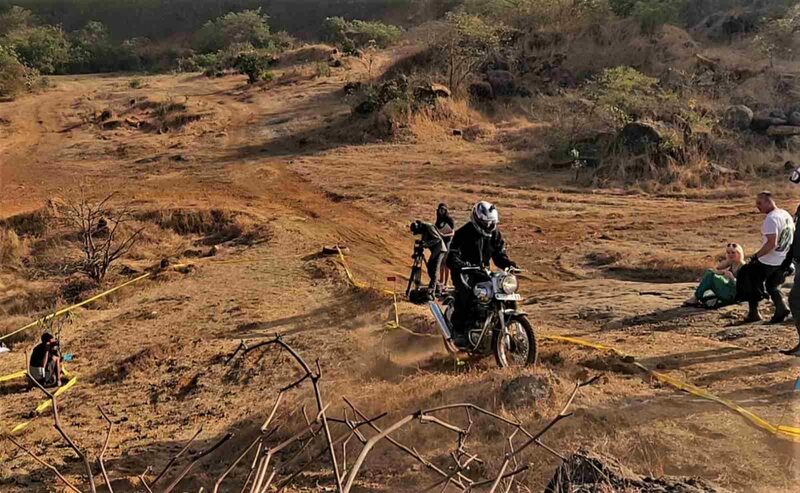 But once you spend some time in the saddle, the bike somehow feels at home while hopping over undulations, rocks, mounds and all things unpaved. But it feels that way when in motion. Try taking a tight corner slowly or manoeuvre it manually and it does give you a good workout and stays authentic to being a tribute to a machine from the 50s. One of the sections was a timed course where we could put our feet down and the objective as to get around and come back as quickly as we could. It was here that we felt that the heel-n-toe shifter could’ve been a toe only affair, because your left heel does accidentally shift up when you’ve stood up on the bike, trying to clutch it with your limbs. The pegs too could’ve been more rear set and machined units, instead of the rubber that’s slipped into metal. There were instances when we tried to pass through narrow passages and the pegs would come into contact with rocks. The 130 mm clearance too, is good until you hit a mound carelessly and then things start kissing the ground. When you try to go fast, there is always a time when you’ve got to stop, or at least slow down. In that department, the Trials could definitely do with a little more braking force and that ABS system could’ve been switchable for the rear wheel at least. Besides those things, we were quite satisfied with how the Bullet Trials felt rigid while being ridden violently through the rough. Not something you’d expect from a machine that is essentially a Classic. Also, the suspension has been tuned quite well for this Bullet to feel Bulletproof if you punish it through some serious challenges. It isn’t perfect, this bike, but it feels at home while doing what a proper off-road bike would do and that’s uncanny. 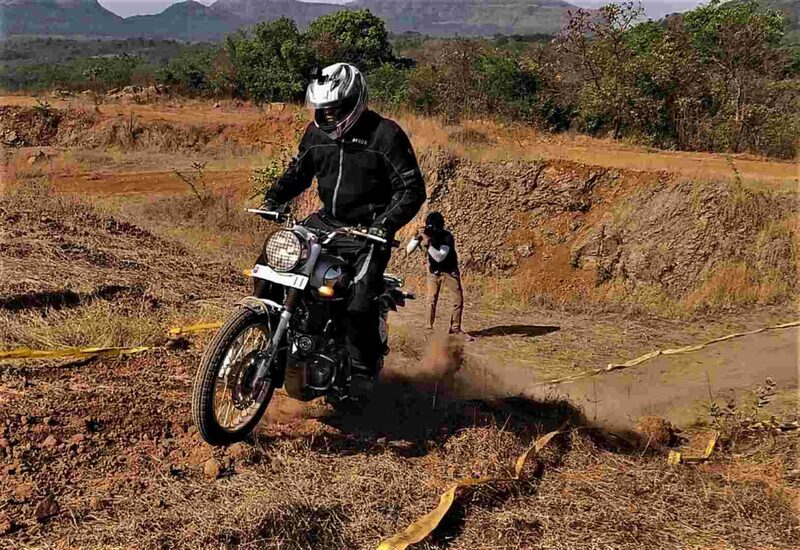 The Royal Enfield Bullet Trials is more of a personal motorcycle. The single saddle certainly highlights the singularity of its existence. It isn’t for everyone. But for those who travel to the Himalayas and have to have to ride till there astride their Classics, this is a more capable alternative and it doesn’t ask for too much over those popular REs either. There’s that Himalayan of course, but this would be for those who only mount themselves on a war-era design. In isolation, it’s fun too once you wind your head and muscles around it. For the logical biker though, there’s nothing new. But there’s also no logic to the fact that two inherently unbalanced wheels bring about so much balance to a motorcyclist’s life. Can a motorcyclist be a logical person then?